This Mac dictionary talks, but do you need to listen? 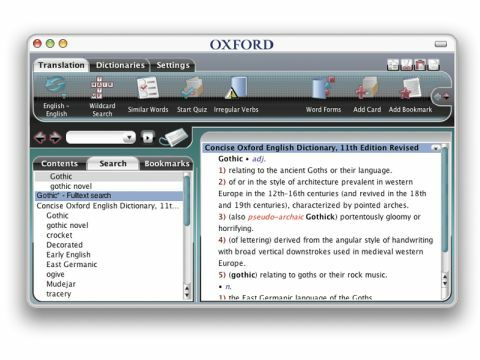 While Paragon Software's Talking Concise Oxford English Dictionary and Thesaurus are marketed as separate applications, they work together in the same window, providing definitions and synonyms in one view. Every word is clickable to bring up its own definition; 20,000 of the 240,000 dictionary entries are accompanied by audio pronunciations; and entries can be summoned from within (some) other apps via mouse-hover or a mouse-and-hot-key combo. But with the OS X bundled dictionary providing much the same functionality and an Oxford lexicographical source (albeit an American one), it's difficult to see what benefit beyond its audio content the Paragon product offers. However, Paragon's software does have some nice features, which are absent from Apple's Dictionary. For example, there is a wildcard search using * to represent characters, so that "*cat" brings up "wildcat", "fat cat", and so on. There is also a "similar words" function. But these don't compensate for a slightly tricky interface and the often-broader range of vocabulary found in the Apple product. If you need the ultimate authority on the English language then you need this, otherwise, it's probably best to stick with Apple's free dictionary.